Last year around this time, I posted a gradient of the nails I did for the Global Dance festival. This raver's fantasy is all about EDM and lights and good times. The ensembles are always bright and colorful, so my nails had to match. I chose to do a gradient, which is super subtle in the shot I got, of Lollipop! Goes the Princess (Sation) and Purity (Zoya). The white is near the cuticle, and the pastel lavender is near the tip. Like I said, really really subtle! 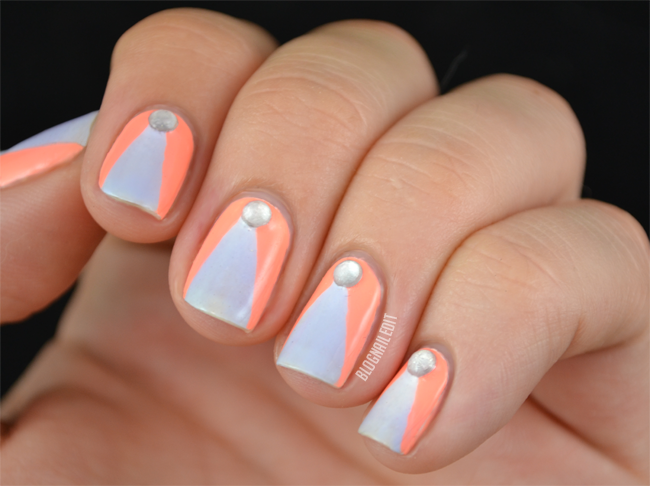 I think outlined with a triangle cutout of Sun of a Peach (China Glaze). The rhinestone accent is from my Born Pretty Store rhinestone wheel (reviewed here). 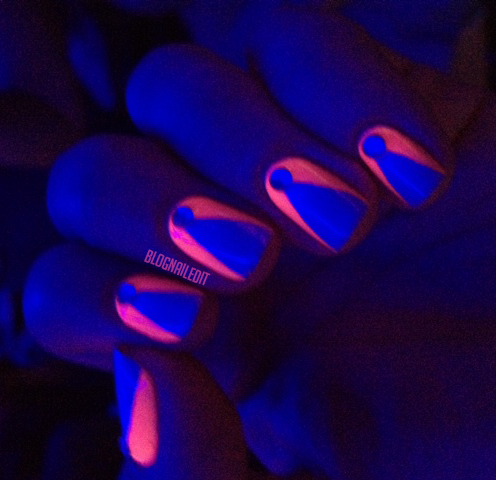 It matched my shirt, and as you can see in this blurry pic I snapped, glowed amazingly in black light!